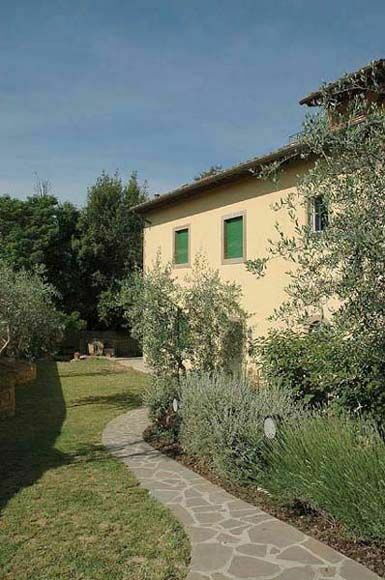 Beautiful villa close to charming Florence, a villa quietly situated at the foot of Poggio Imperiale, very close to the centre of Florence but at the same time far from the traffic and noise of the city. The house has been recently restored and turned into 3 nice apartments (one of which is occupied by the owners) offering charming and tastefully furnished interiors. Distances: food shops 800 m, Galluzzo with all kinds of shops 1 km, Porta Romana (city centre) 2 km, the renowned Piazzale Michelangelo enjoying marvellous views over the city of Florence is in a short distance. The Observatory of Arcetri and the villa “Il Gioiello” where Galileo Galilei worked and lived are only a few hundred metres away. Pisa, Lucca and Siena are reachable in a 1 hour drive. At guests' disposal: shared swimming pool in a close by property - approx. 30 m away- (15 x 6 m - maximum depth 1,5 m - open from 01/05 to 30/09). All apartments are provided with air conditioning, safe and internet access (ADSL). Parking within the grounds. Extra services: By arrangement it is possible to hire an extra bed € 50,- / per week (to be paid on the spot). Baby bed available free of charge. Maid service available on request € 10,- / per hour (to be paid locally). 90 m2 2nd floor: living-room (sat. TV) with double sofa-bed, kitchen corner (oven, freezer, dishwasher, washing-machine, dryer) and dining area, double bedroom, twin-bedded room, bathroom with tub and shower. Small panoramic terrace offering beautiful views over the surrounding landscape. Additional costs paid on site: Security deposit: € 150,-Final cleaning: € 60,-Heating: according to consumptionElectricity: according to consumption.